Sadly the family of Olga Lylyk (nee Reszitnyk), wish to announce the passing of our mother, grandmother and great grandmother on January 27, 2019 at the Gilbert Plains Personal Care Home. Olga passed away peacefully after a brief and traumatic time. Olga was predeceased by her husband Bill in December 1995; her parents Mary and William; her brothers Nick, John and Nestor; sisters Rose Furkalo and Ann Chernecki. 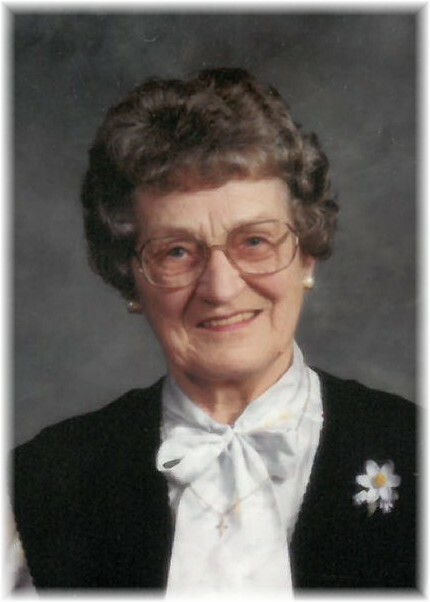 She leaves to mourn her passing her children, Dianne Wintoniw of Swan River and Lorraine (Raymond) of Pine River; her grandchildren Michael (Donna), Daniel (Dawn), Kathy (Ray), Johnny (Jenna) Corey (Kim), Chris (Carla); great grandchildren, Morgan, Dakota, Quinn, Rogan, Westyn, Parker, Emma, Zach, Kaitlyn, Tanner, Ashley, Blake; one great great grandchild; sister-in-law Nettie Basaraba of Winnipeg who Olga had a very special bond with; and many nieces and nephews. Olga was born in Sclater, MB on April 5, 1924. She attended Chistina School until she was 14 years old when she left to work, because the war had just started and money was scarce. She had many jobs in Winnipeg, she cleaned houses, worked in stores, was a cook’s helper and then a cook. The hardest job she did was in a warehouse loading boxcars of cement bags and lumber during the war. After the war was over she went to Ontario to work. Then one day coming home for a visit she went to a dance and there she met the love of her life, Bill. As they say the rest is history. They wed on August 4, 1947, bought a farm of their own with a two room house full of mice and gophers but like my mother said we were happy. Our mother always said they picked mushrooms, fruit, they grew a big garden and they survived. As they farmed through the years, they got bigger, raising pigs, chickens, cattle, and milking cows. Then when things were looking good, her husband passed away. Olga then retired to the villa in Pine River where she enjoyed gardening and playing bingo. Twenty-two years later she had to move to the Gilbert Plains Personal Care Home. In lieu of flowers, donation in memory of Olga may be made to the Gilbert Plains Personal Care Home. Funeral Service was held on Thursday, January 31, 2019 at 11:00 am from Sneath-Strilchuk Family Care Centre in Dauphin, MB with Rev Father Yaroslav Strukhlyak officiating. Interment followed in Riverside Cemetery in Dauphin, MB. Pallbearers were Michael Hlady, Daniel Hlady, Johnny Wintoniw, Corey Saley, Chris Saley, Kathy Wintoniw.